It's that time of year - and I'm not talking about red starbucks cups and Christmas music everywhere you go. 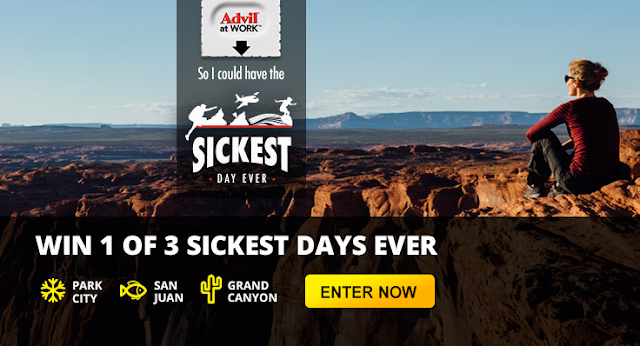 It's cold season and today I am sharing Advil's Sickest Day Ever Contest with you. I was invited to take part in this contest the day my husband and I left for Ireland. In my travel bag, I was sure to pack Advil® Sinus Congestion which is my go-to sinus medicine of choice. If you pack it, they will come and Murphy's Law visited us on our trip. 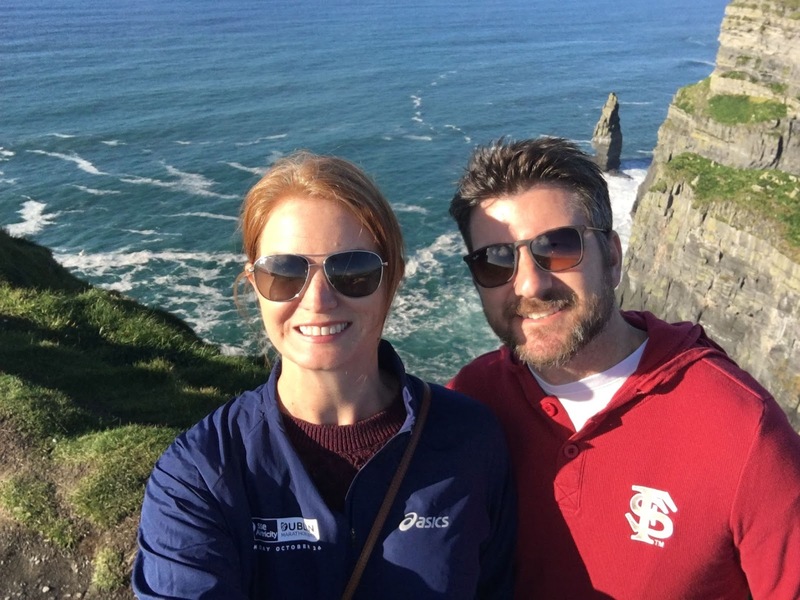 On day three of our Vacation, right before the Dublin Marathon, both of us started feeling under the weather. Both of my ears hurt and I had awful sinus pressure. We were both congested with headaches and I was SO happy to have that box Advil® Sinus Congestion with me. We were able to continue our vacation and I finished my 5th Marathon in Dublin Ireland. 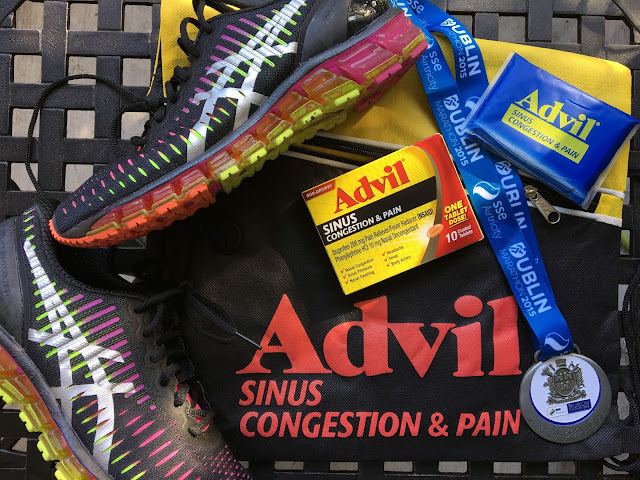 Advil® Sinus Congestion is the only over the counter cold and sinus medicine which combines the speed strength of Advil® with a proven nasal, decongestant for fast, effective relief of severe cold symptoms including sinus pressure and headache. Instead of having our Vacation ruined by a cold, we were able to continue on with an active trip, hiking and having a great adventure all over Ireland. Advil® Sinus Congestion allowed us to have the sickest trip ever! 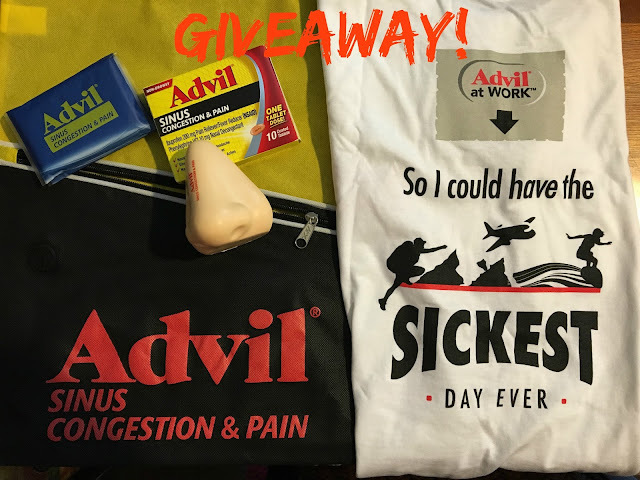 I have a Giveaway for a Advil® Sinus Congestion prize pack including a $25 Visa Gift Card but before I get into that, check out Advil's Sickest Day Ever Contest and be sure to enter here for your chance to win an amazing trip! Advil® Sinus Congestion & Pain provides fast, effective relief of your severe cold symptoms, so you can enjoy your sickest day! All you have to do is record a video saying the tongue twister below. You will be entered for a chance to win a trip and other great prizes. Even if you don’t win the Grand Prize, you still have a chance to jump in on the “Sickest Day Ever;” after entering the Grand Prize Sweepstakes, click the link to the Weekly Prizes page, and confirm your email to be entered into the drawing! Fill out this quick “Sickest Day Ever” entry form and enter for your chance to win the Grand Prize trip and other fun prizes. Now for my contest! I want to give you an Advil® prize pack along with a $25 gift card! Let me know in the comment section below if you've ever been sick on vacation before - and if so, where were you? Be sure to track your response on the Rafflecopter widget below and visit the Advil® contest and Facebook page for more chances to win! No, I have never been sick on a vacation. I had morning sickness while on vacation in Portugal. I cut my trip short. I would go to the Bahamas. Yes, I had a really bad head cold which turned into a sinus infection while at the beach this past summer with my family. I was miserable! I would love to go to the Grand Canyon if I won! I had a horrible headcold when we went on a cruise a few years ago. I would choose the go to Puerto Rico. I have migraine while on the cruise in Italy. I would go to Park City, UT. I've never been sick on vacation but my children have. We just drove up 4 fours and they began coughing and continued all night long. The next day we tried to go to a theme park but they had a fever and we had to leave without doing anything. Poor things. I've never gotten sick on a vacation, other than getting a bad headache. For which i took Advil. I had a urinary tract infection when I went camping at the Bounday waters in MN. I just had to tough it out. I would LOVE to go to Colorado!!! I would want to got to Utah for skiing. I haven't gotten sick on vacation. I'd pick Grand Canyon, AZ. I get sick most of the time when I go to FL, sun poisoning, ear infections, colds. Not fun. I would go to the Grand Canyon. I have never gotten sick on vacation. Fortunately, I do not remember getting sick on vacation. I've never gotten sick on a vacation. Only vacation we ever had we went to Florida to visit my moms side of the family and I was extremely sick the whole time! Runied the whole thing for me. I literally laid in bed the 4 days we were there. It was horrible. I've always wanted to go to Hawaii so that'd be it. I have, I was very sick on a trip to Disneyworld. I got a bad cold at Disney World this year. Not fun! No I have not gotten sick on a vacation. I would go to the Grand Canyon! I would go to New York. I was sick at an amusement park in Cincinnati. I haven't ever been sick while on vacation. Once a friend an I were on a short road trip and she developed a nasty migraine. If I was the lucky winner I would go to the Grand Canyon since I haven't been there yet. I would like to go to California. I've unfortunately been sick on vacation several times! On a recent girls weekend, my poor friends had to take me to the ER! No fun! I'd go to Puerto Rico if I won the sweepstakes! I would go to San Juan, Puerto Rico if I won. It would so great to go to San Juan, Puerto Rico if I won. I have when I went to San Francisco, CA. I had a bad cold and could not enjoy our vacation. I have not gotten sick on vacation. I would go to Grand Canyon, Arizona. No, I have never been sick on vacation. I would go to San Juan, Puerto Rico. I've been lucky enough to get sick after the vacation - we traveled to Las Vegas. I once got sick while on vacation in Connecticut and it made the flight home miserable.